Description Bellefonte Historical Railroad Society is an all volunteer staffed 501(c)(3) not-for-profit corporation dedicated to promoting, preserving, and fostering a public appreciation of the railroading heritage of Bellefonte, Pennsylvania and beyond. Currently excursions are held twice a year but operations with our Budd RDC1 9167 are slated to occur in late 2016! The Fall Foliage ride is held in October and showcases the beauty of the changing seasons in the valley region of Central Pennsylvania. The Santa Express rides are usually held a week before Christmas and features a reading of Chris Van Allsburg's The Polar Express and a visit from Santa Claus and his friends. 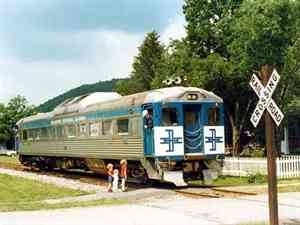 Please check www.bellefontetrain.org for dates and times. Add Bellefonte Historical Railroad to your free online travel itinerary.